It’s New Year’s Eve and the night is resounding with a constant barrage of fireworks. It will continue to get louder and crazier until midnight, at which point the Netherlands will sound like a war zone. For now I’m taking refuge inside, though we’ll join the craziness on the streets later. First I need to finish this blog. Tonight I wrap up this blog project with a random collection of Things from all three categories: beading, crochet and sewing. Let’s start with beading. The first piece of jewelry is a three-strand elastic bracelet with an assortment of pink glass beads, finished off with a lock and key charm set. The second is a simple slip-knot necklace, made with white leather cord and a big flower pendant from my stash. The last piece of jewelry of 2014 is a necklace with some kind of stone (agate? ), freshwater pearls and metal seed beads. I made a mistake the first time I made it. Can you spot it? I thought the section with three stone beads was in the middle. This evening I restrung it, removing the extra bead and adding some more seed beads to compensate. The next category is crochet. This Thing was a gift for a young friend, Rebecca. 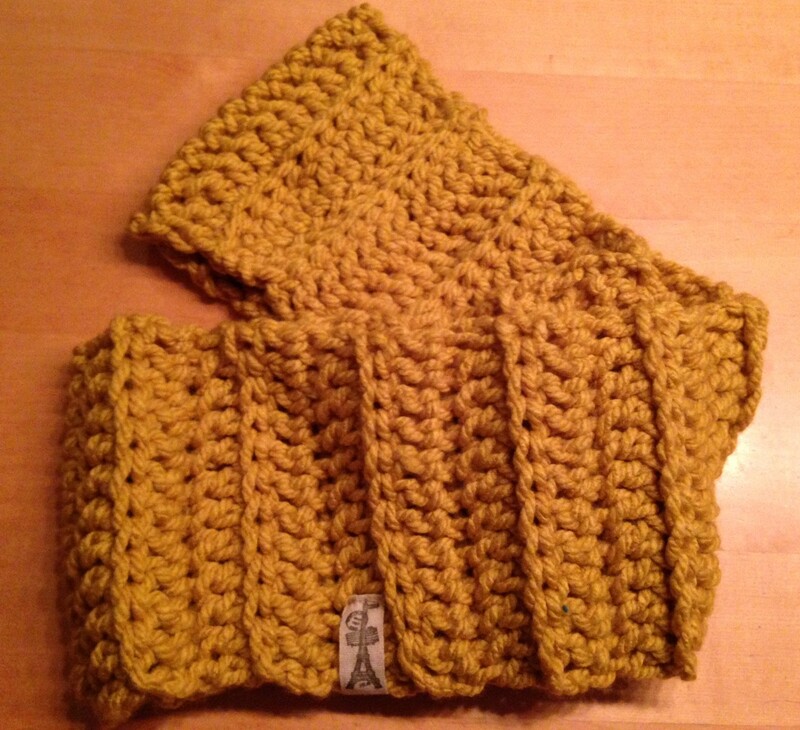 Earlier this year I made her a yellow toque and scarf with the yarn left over from a blanket from her Oma. There was still enough left for one more gift. For her birthday, I crocheted a bag to hold her crocheted turtle, Pumpkin, that I made for her last year and that she sleeps with every night. I improvised a pattern and finished it with a drawstring cord with tassels. I included another little turtle that I crocheted earlier this year. He can be a little brother for Pumpkin. The last three Things of 2014 fall in the sewing category. She needed a black one to go under her Christmas gala dress. I used the Ohhh Lulu pattern I’ve been using all year. The fabric is from an old t-shirt of mine (the one that I cut the sleeves off of for Esther’s shirt) and the straps are the wide black elastic left over from that project. The next item was a gift. Some months ago Esther made a pillow for her dear friend. There’s a 70-year age gap between them but they get on fabulously. He’s from South Africa so Esther used a fabric that I picked up for her when I was there two years ago. This was her pillow. He loved it so much that his wife asked me if we could make another matching one. Last week I made this. I didn’t position the fabric as well as Esther did, but the pillow was well-received nonetheless and together they make a nice set. My last project of 2014 was the fulfilment of a promise to Esther made a couple of months ago. She requested a cloak, but I kept telling her I needed to finish a bunch of other projects first (flower girl dresses come to mind.) This past Monday I kept my promise. That’s Esther’s solemn, cloak-wearing expression. I found instructions for sewing a walking cloak at the Jane Austen website. The fabric is silver stretch velvet from my stash (from the same shopping trip as the white velvet of the angel costumes). 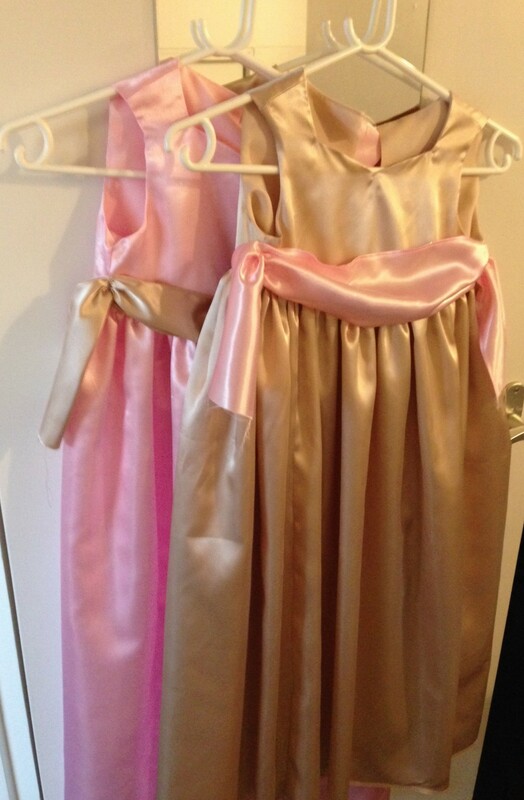 I lined the cloak with the champagne satin from the flower girl dresses. A gold button from Esther’s stash and a white ribbon loop serve as a clasp. Due to fabric limitations I couldn’t quite make it the length Esther wanted (sweeping the floor like Darth Vader) and the hood is a bit smaller than anticipated, but it’s still delightfully swishy and full. So that’s it, folks. 365 Things in 365 Days for 365 Euros. I did it! I think this calls for champagne. Would you look at that? I have €1.02 to spare. Time to go shopping for craft supplies! The theme of today’s post is Winter Wonderland. 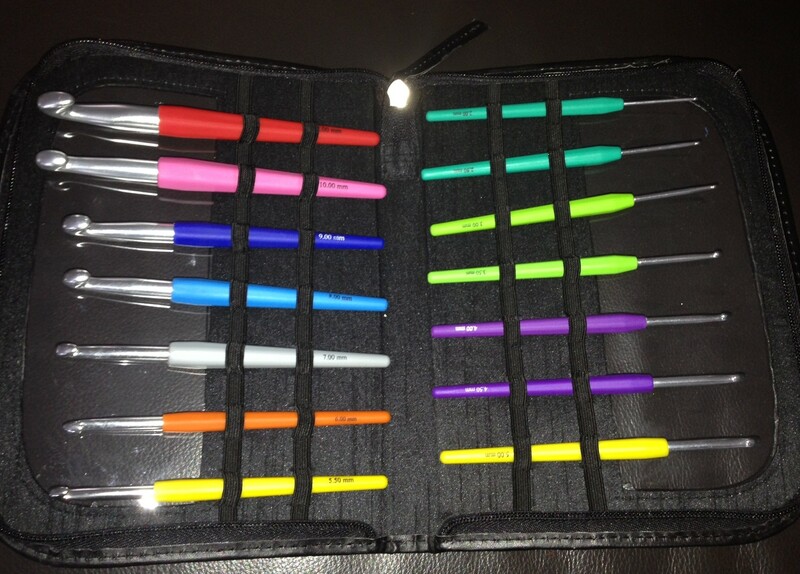 Sinterklaas brought me a crochet hook kit and I was itching to try out all the sizes. So when a local organization issued a call for warm clothing, I got to work. I had already picked up lots of thick, chunky yarn to make more gifts for the Angel Tree, but I figured I would have time to make some extras. 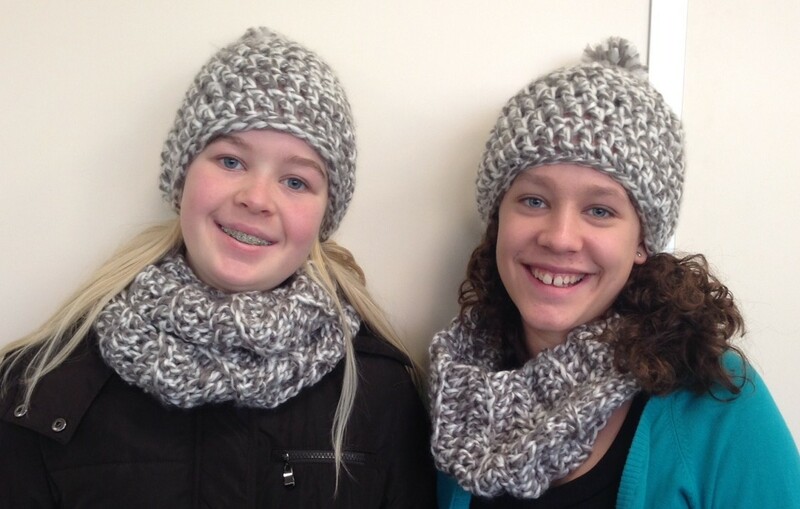 From the first ball of yarn — a grey and white acrylic — I squeezed out two toques, an infinity scarf and a cowl. I didn’t follow a particular pattern. I just double crocheted with my biggest hook (12mm) until the size was right. For the scarf and cowl I crocheted in the back loop only, for a ridged pattern. 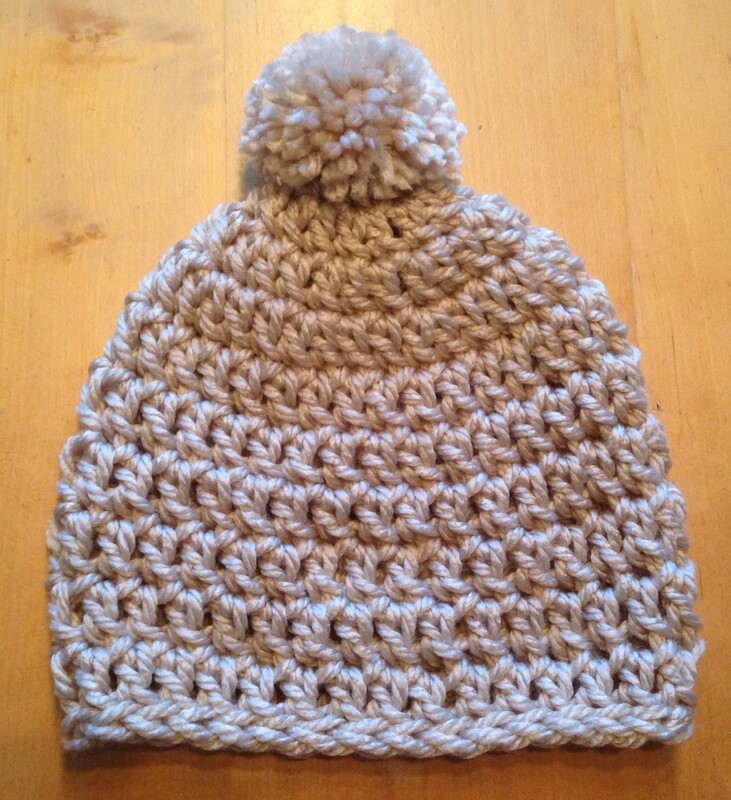 Finally, I dipped into the big ball of cream-coloured yarn and made a cozy toque. I dropped all those off along with some winter coats that the girls have outgrown. It was time to get busy on the Angel Tree gifts. 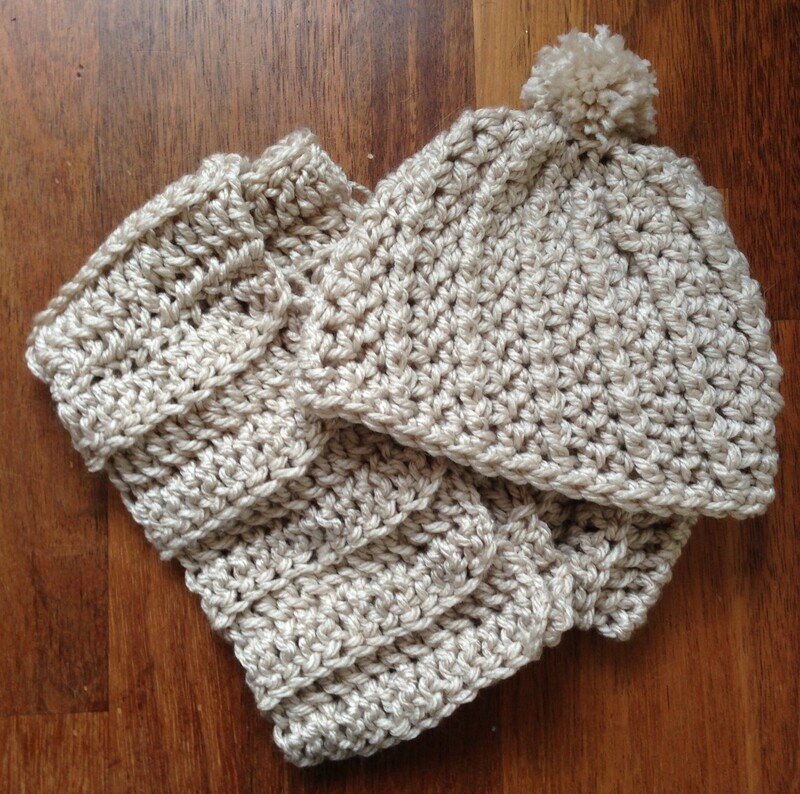 I pulled out the cream-coloured ball and made another toque and infinity scarf. 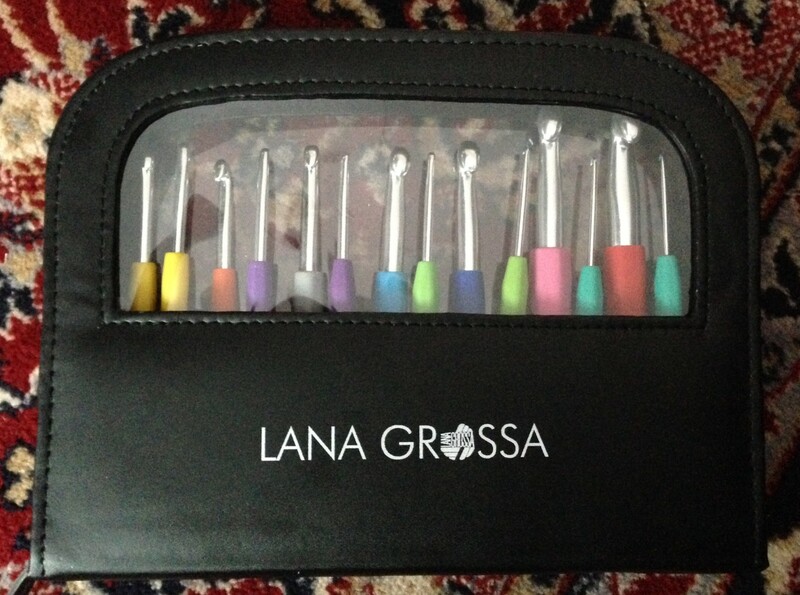 This set was for a 40-year-old woman. 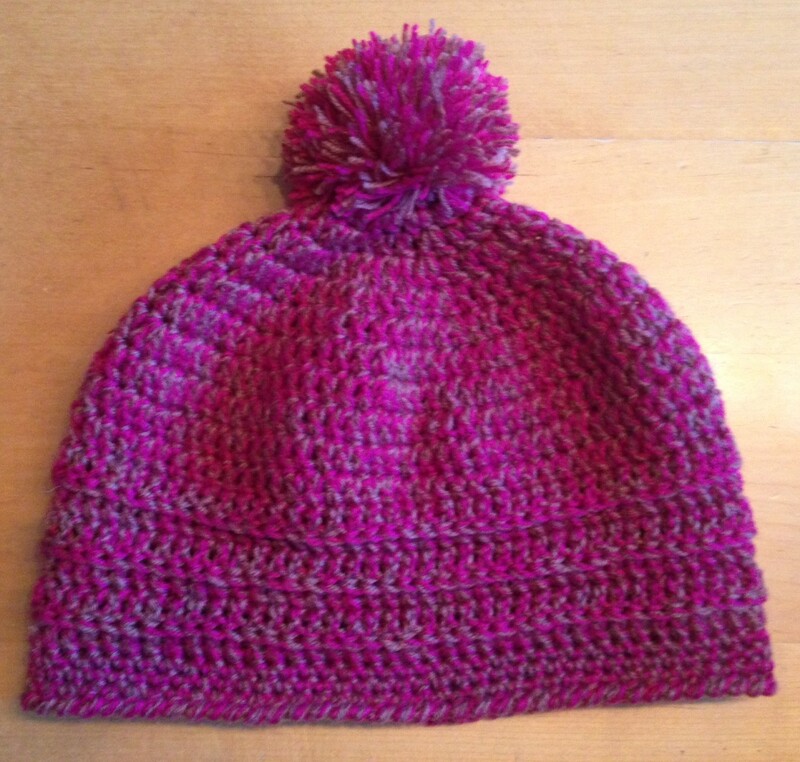 The toque is based on a pattern from Jenna Windgate designs. The pattern is now retired but I still have a print-out and followed it loosely for the basic cable texture. Martina chose to get a gift for a 14-year-old girl. 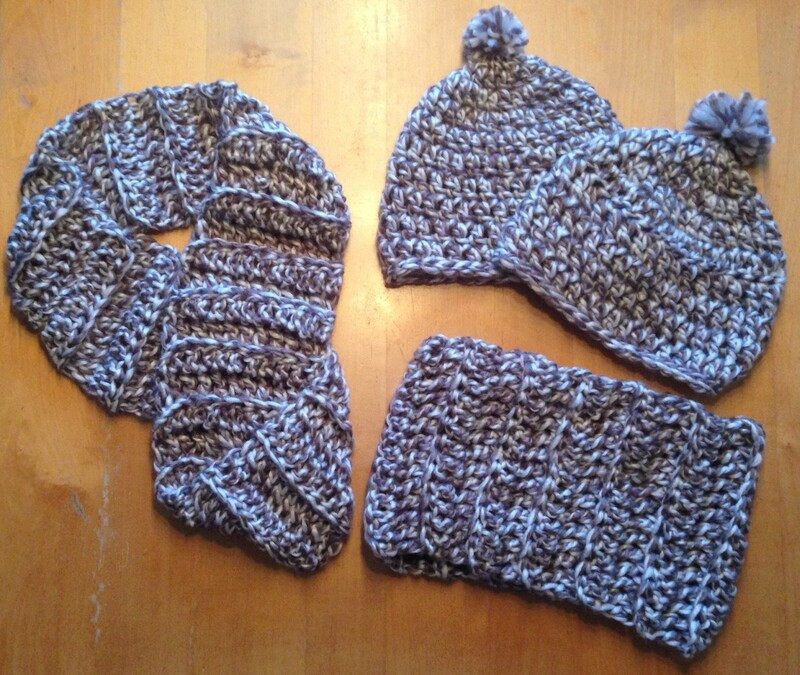 She picked out another ball of the chunky grey and white yarn and I made an infinity scarf and toque. I made this scarf extra wide and luxurious. Next on the list was a gift for a 10-year-old girl. Esther chose a thick red yarn for a scarf. When I was in Amsterdam two weeks ago I visited my favourite shop. It’s a tiny store devoted to ribbon. Bolts and bolts of ribbon. I love that a store that specialized can even survive. I picked up several lengths of ribbon to use as labels. The snowflake label was the perfect finishing touch for this scarf. 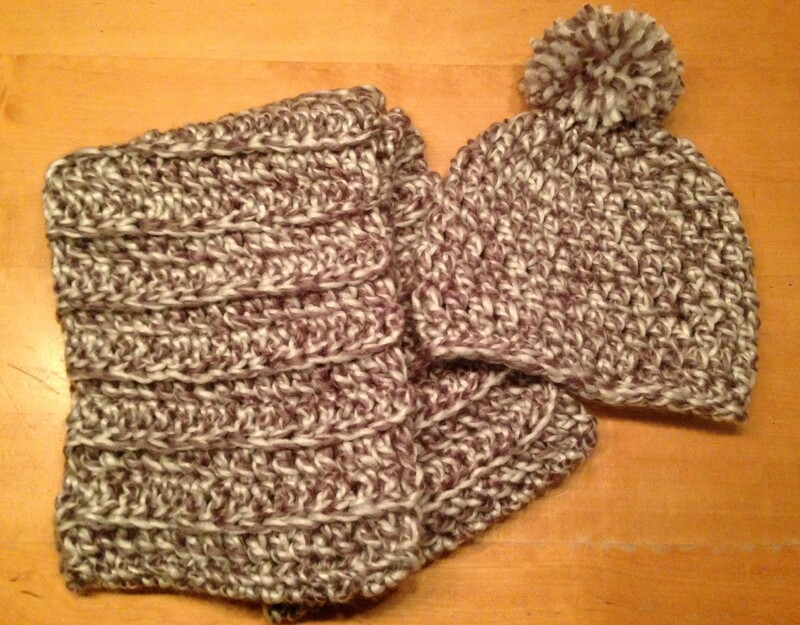 I used the leftover cream and grey/white yarns for the toque, as well as the grey and red left over from my hat trick a few weeks ago. The last Angel Tree gift was for a young man. 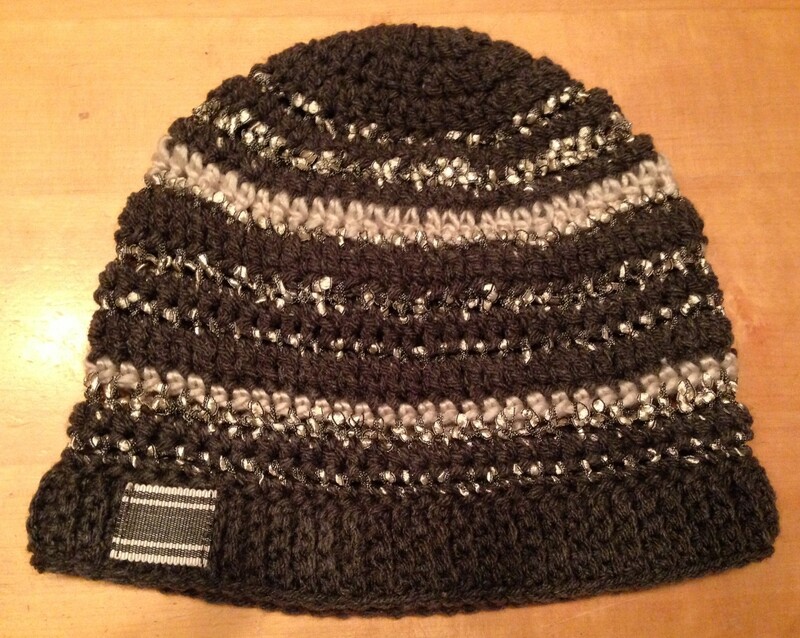 I crocheted a toque with some grey and cream, but the cream had a bit of shine to it and it looked too feminine. With the Angel Tree gifts complete I moved on to other Christmas gifts. 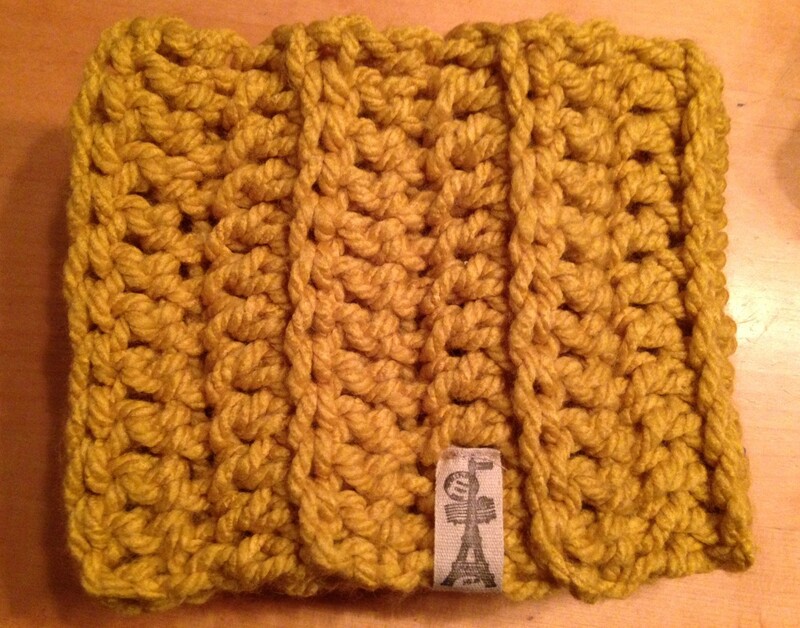 First I made a mustard-coloured infinity scarf for Martina’s friend, Jessica. 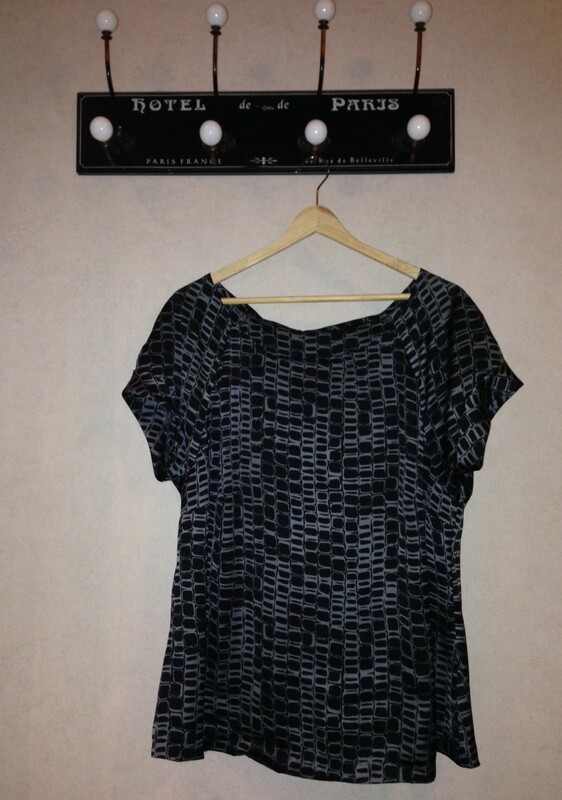 I love the Paris label (from my Amsterdam store). By this time, Esther wanted in on all the infinity scarf action. 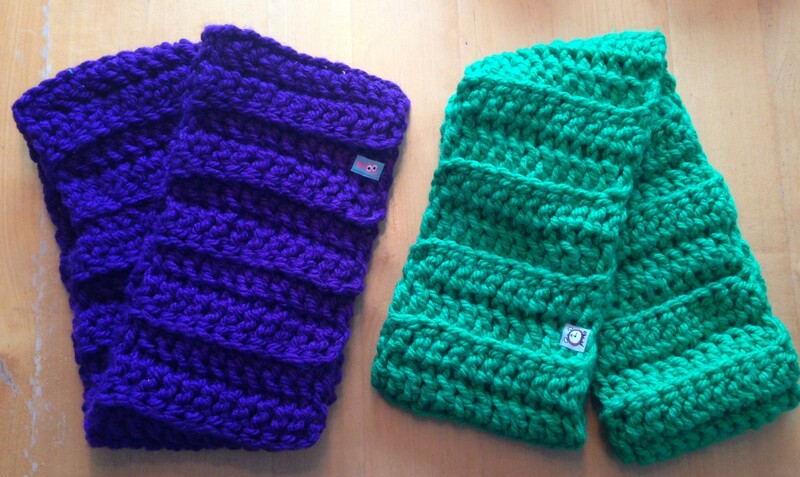 She chose out green yarn for herself and purple for her friend, Daniëlle. 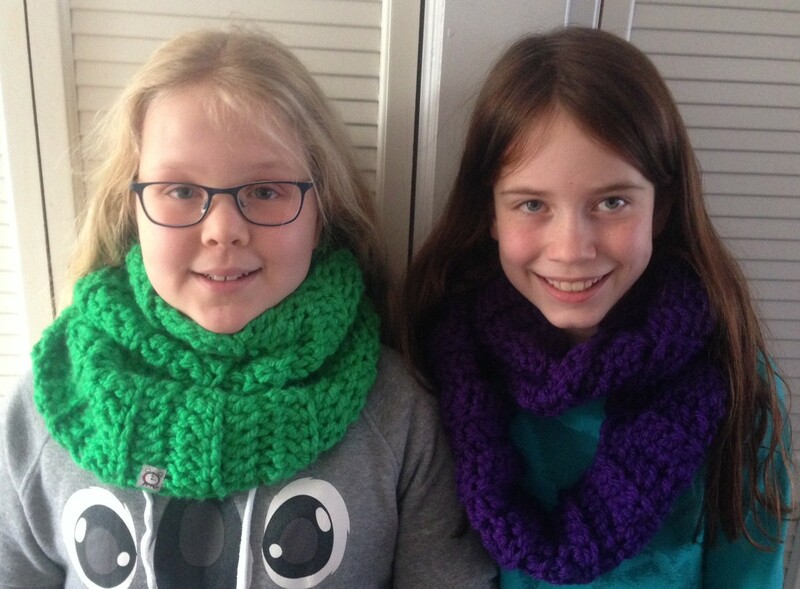 I made them each a scarf and Esther chose iron-on labels from my stash. 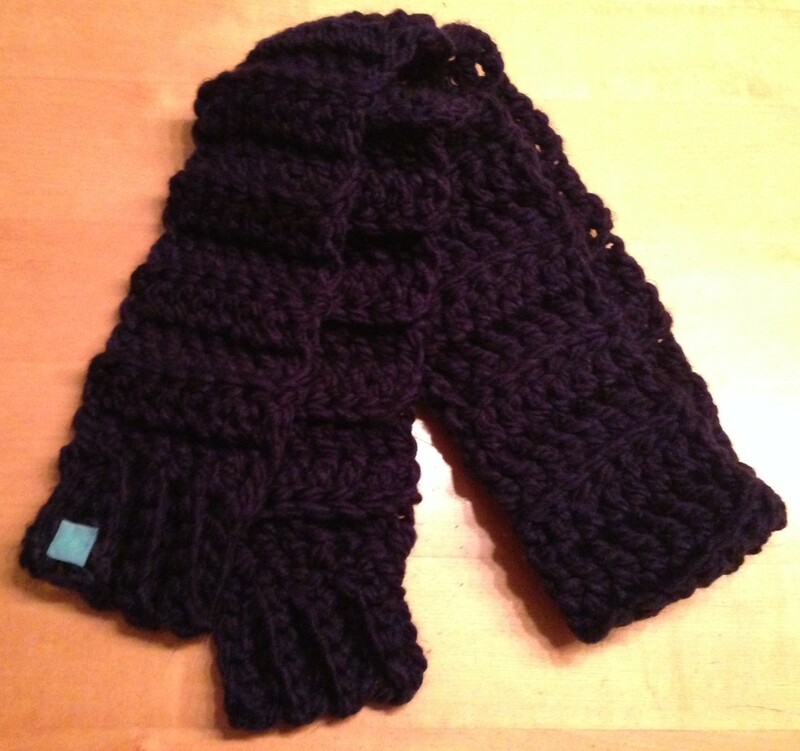 Next on the list was a navy blue scarf for Jessica’s little brother, Jonathan. 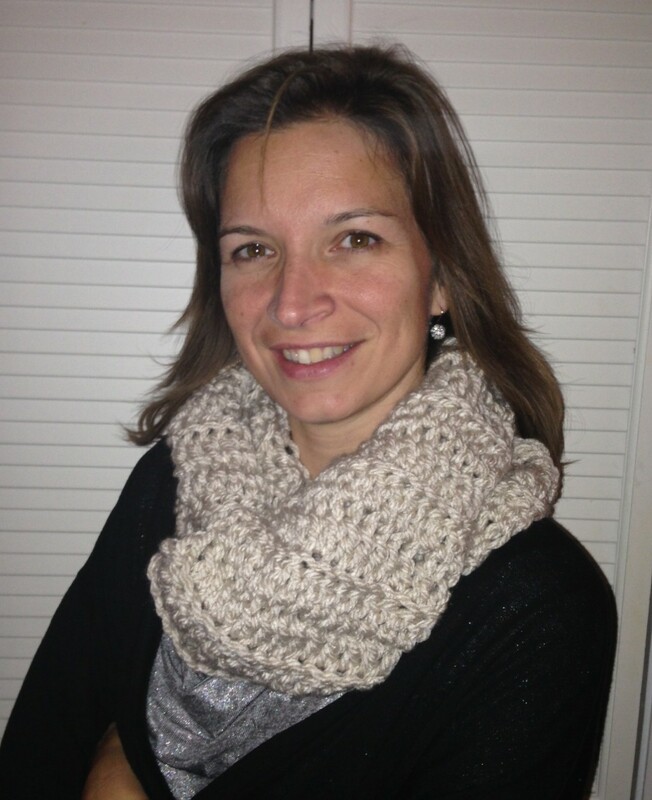 With the last of the chunky cream-coloured yarn I made one more infinity scarf for my friend, Rochelle, the one who started me on this crochet adventure. 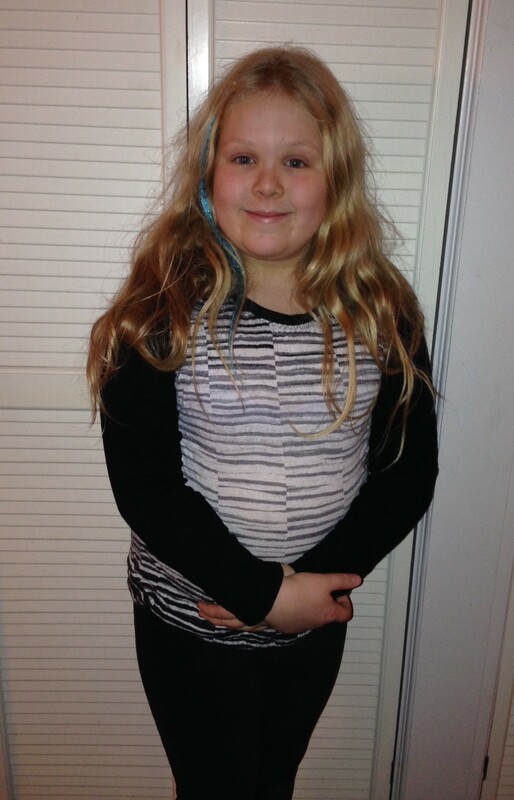 The matching toque, with navy blue stripes from Jonathan’s remnants, went to her daughter, Eline. By this time I just couldn’t sit still anymore. Must. Keep. Crocheting. I scrounged around for any and all suitable yarns and made six more toques. 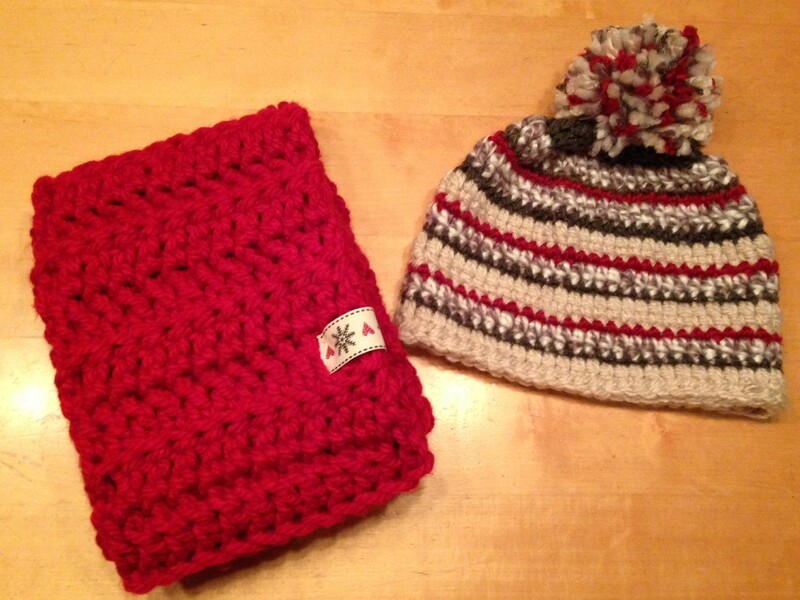 These will be going to the Ukraine, along with the non-manly men’s toque. Our church is working with a church there to help people displaced by the conflict there. * note: I forgot to include the ribbon cost when I first posted. This has been corrected above. Today’s theme is Wedding Extravaganza. 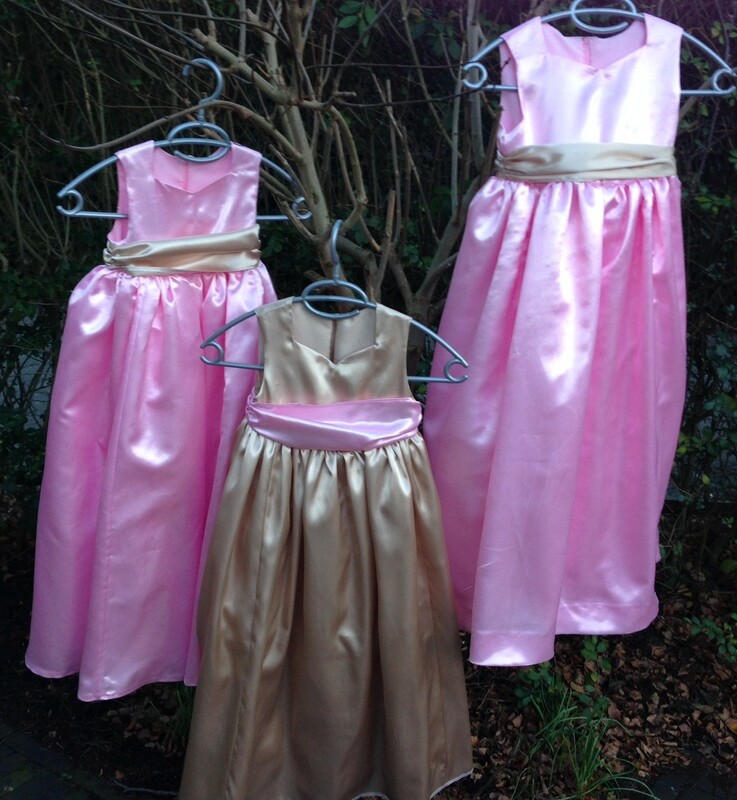 What a learning curve, wrestling with yards and yards of satin and tulle. Each dress has a tulle slip plus another satin slip with a giant tulle ruffle. 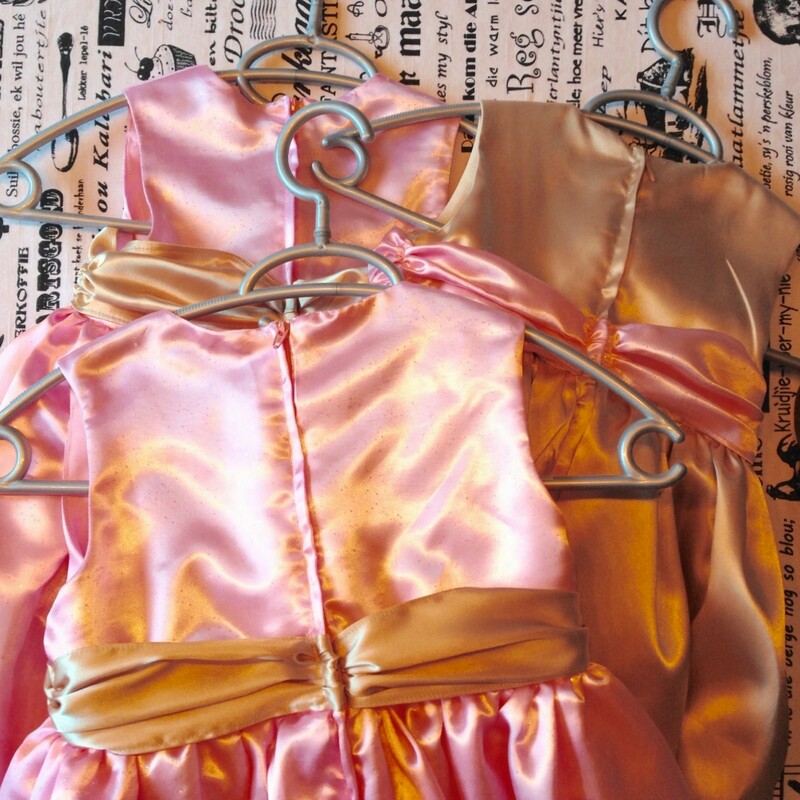 The dresses look much pouffier when worn than they do here on a hanger. The zippers, as usual, gave much grief, but eventually submitted to my will. Not before I sewed my finger to the champagne dress, though. The machine needle actually went through the tip of my index finger. Fortunately I did not bleed on the dress. 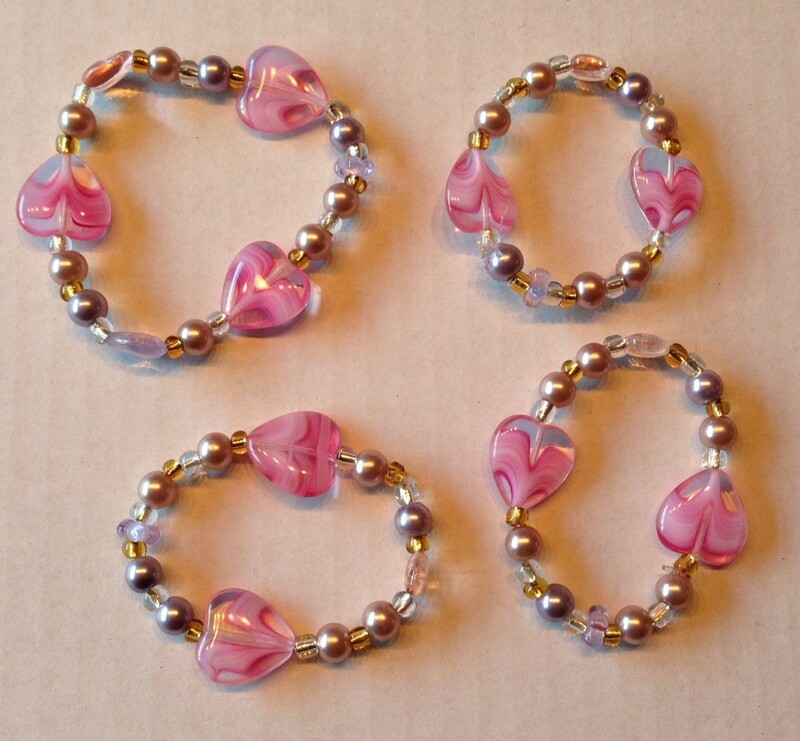 Next I made some matching bracelets for the flower girls. I rummaged through my stash and found an assortment of champagne and pink beads. These I strung on elastic: three tiny ones for the littlest of the flower girls (who will be wearing the dresses I made) and one bigger one for the older flower girl (whose dress I didn’t make). The girls were taken care of so I moved on to the boys’ outfits. 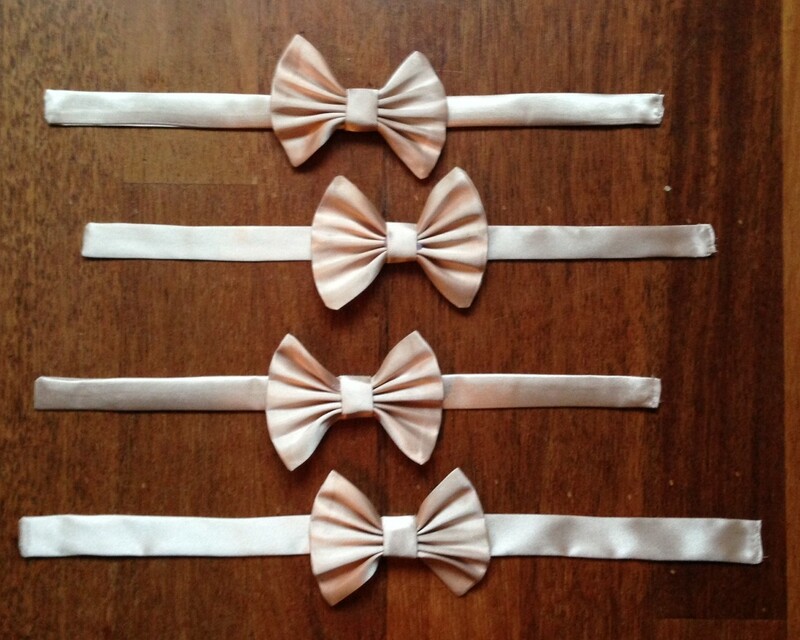 Using the same champagne satin from the dresses I made matching bow ties for four little boys. The Bosco bow tie pattern from Sisboom.com is quick, easy and free. With a bit of starch, some sewing and liberal use of my glue gun I finished these in an afternoon. They just need velcro or a safety pin to attach them under the collar. Finally, for the sister of the groom (and mother of three of the flower girls and dear, dear friend of mine) I made a necklace. 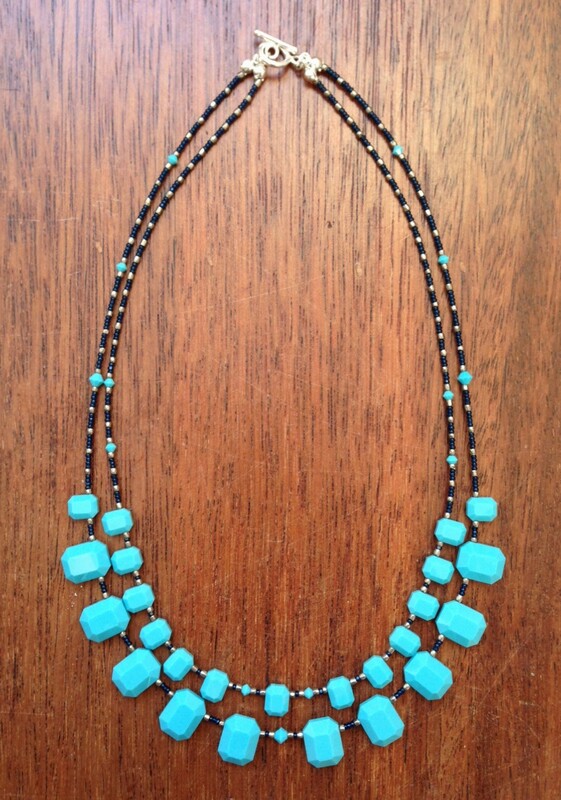 I’ve had these vintage turquoise Swarovski crystals for many years. I’ve tried to use them several times in the past but it never worked out quite right. This time I paired them with navy blue glass and metal seed beads in a two-strand necklace that came together effortlessly. It was obviously meant to be. So everyone’s ready and the celebration can begin. Congratulations, Ardjan & Erin! Five years ago a local fabric store went out of business. 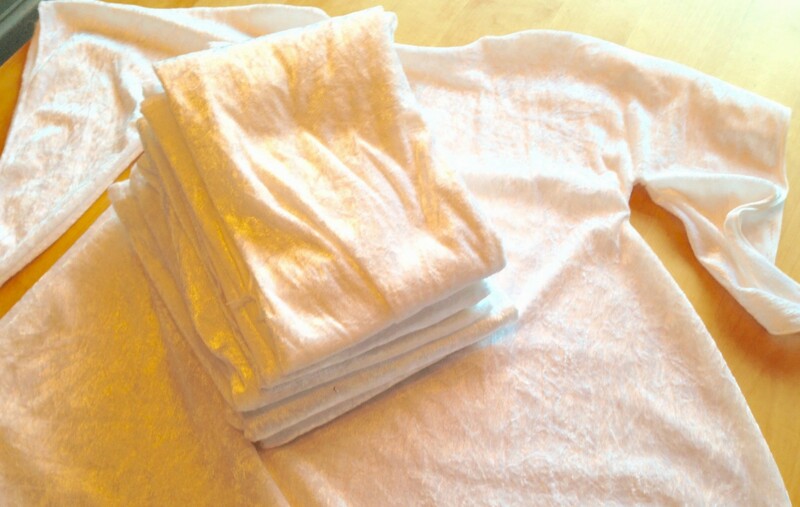 I bought several metres of shiny white stretch velvet with the intention of making angel costumes for our church’s annual living Nativity program. I revamped all the other costumes — wise men, shepherds, sheep, Mary and Joseph — but could not seem to get around to making the angels. Year after year we made do with some artfully draped silver fabric, and every year I vowed that the next year’s Christmas Eve service would see magnificent angels. It took this blog to finally make it happen. And the embarrassing thing about it? I made six costumes in under an hour. Less than ten minutes an angel. I didn’t follow a pattern. Instead, I folded the fabric in half, cut out a basic robe shape, and stitched it together on the serger. 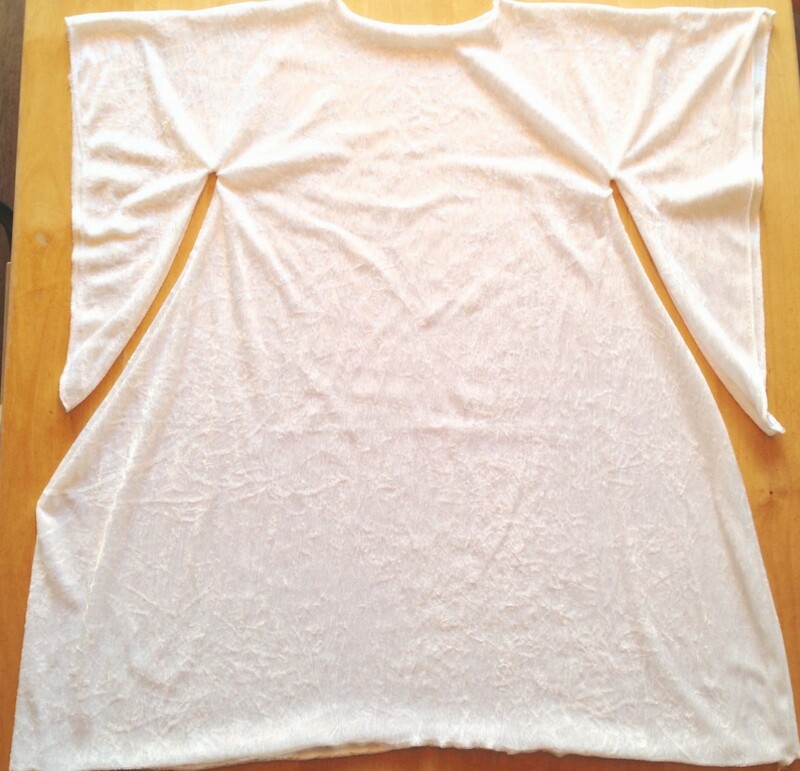 I also serged the raw edges around the neck, sleeves and bottom hem. I cut the first one with the stretch going up and down. That wasn’t such a good idea. 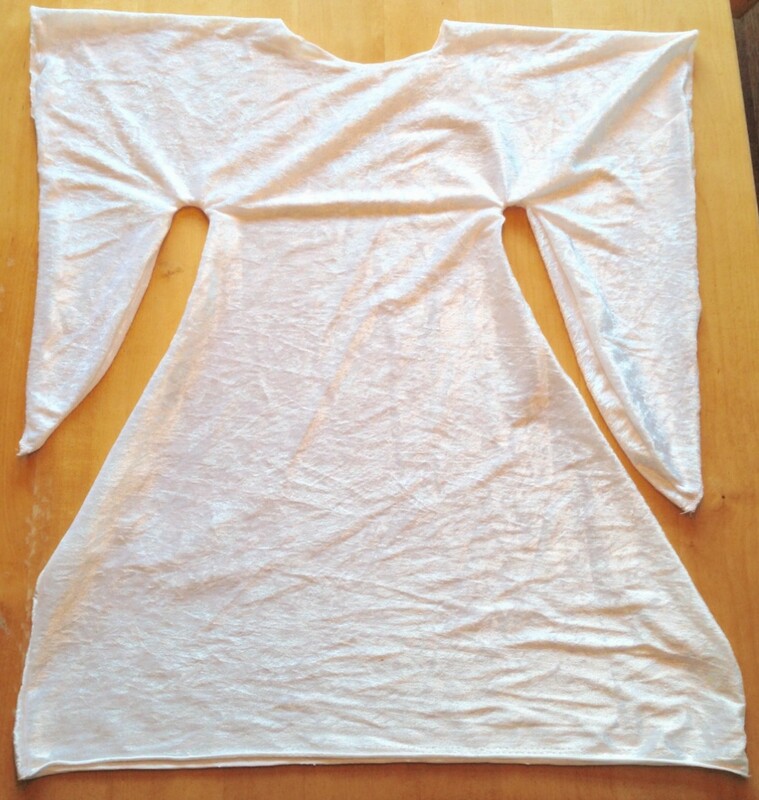 I also cut it too small around the waist, and since it has no give in the width, it only fits the smallest of angels. 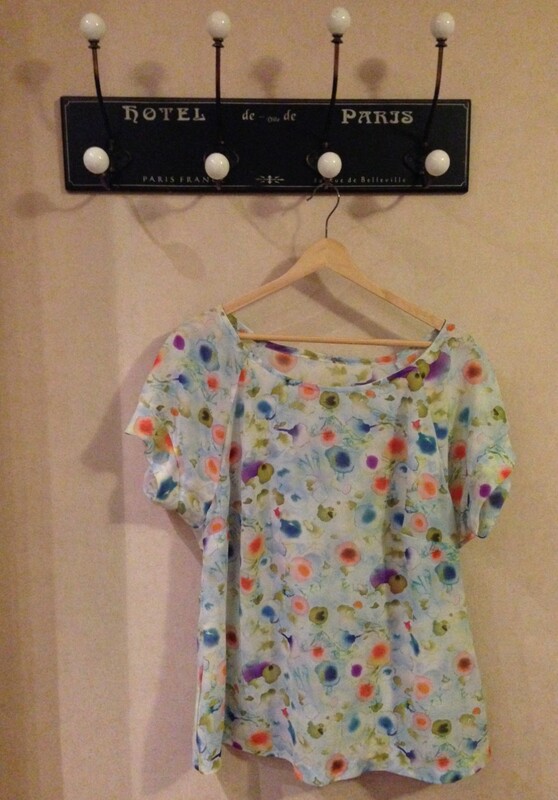 (It was worn last night by a sweet and slim three-year-old.) I’ll probably add some extra panels in the side. Next year. Ha! For the next five I cut with sideways stretch. This meant the sleeves couldn’t be quite as long but more importantly they fit most kids. All six costumes were used last night. With added wings and halos they were an angelic host indeed. 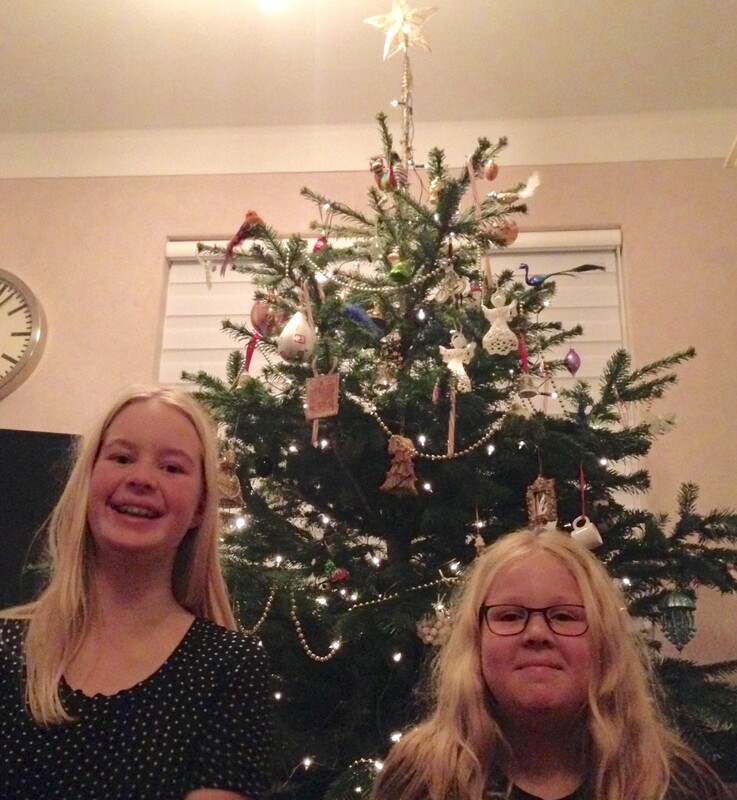 I don’t have any photos to post so instead I will leave you with this photo of Martina and Esther in front of our Christmas tree. I’m going to do it, folks. I’m going to meet my goal and finish this 365 blog project. I haven’t been writing lately but I have been making. Sewing, crocheting, jewelry making — it’s been a regular elf workshop around here. I’ve even managed to stay under budget. Now I just need to write about it all. I’ll be posting in large batches, by theme, over the next week. 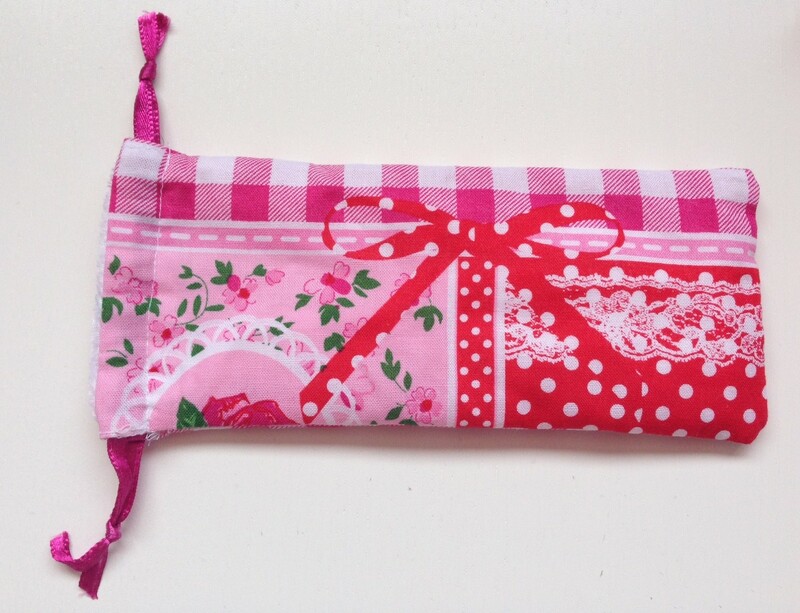 I used scraps of fabric from several projects of the past year: the great tissue pouch marathon, Martina’s summer pyjamas, Esther’s Liberty blouse and skirt, my second Belcarra blouse and Martina’s desk accessories. 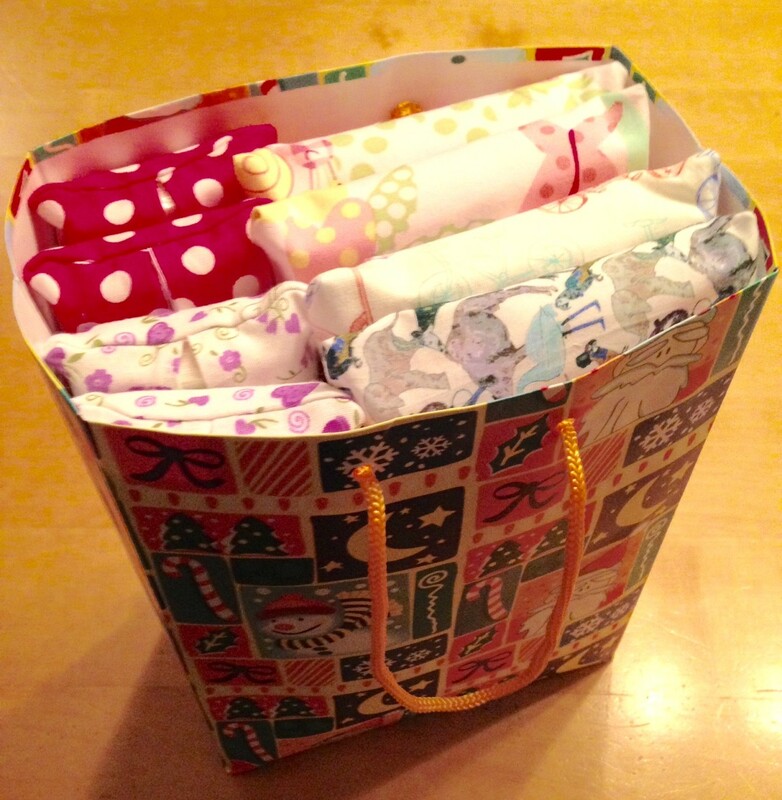 This bag full of tissue pouches went to our church’s Angel Tree project, which brings Christmas gifts to women and children in a local shelter as well as men and women in drug/alcohol addiction recovery programs. 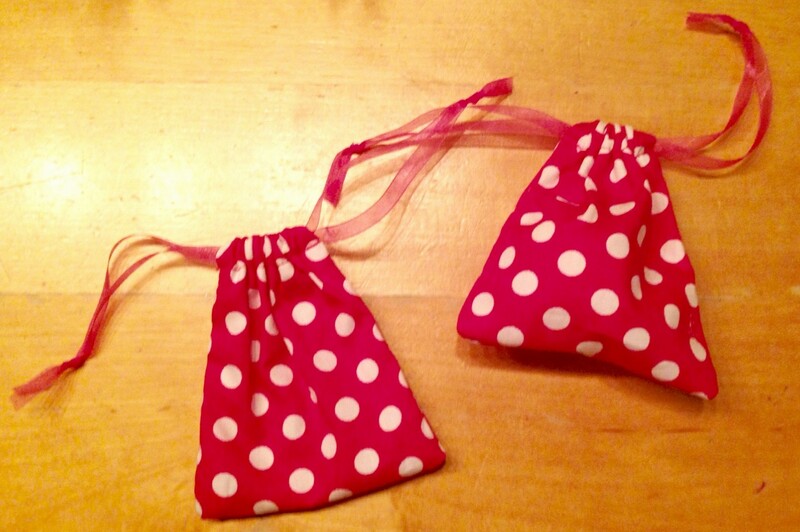 And since I still had scraps left over, I quickly whipped up a couple of gifts bags for a bracelet and a lip balm. And that was the last you will see of tissue pouches and gift bags. No more! Never again! Or at least not before 2015. The cold weather is upon us and I’m back to obsessive levels of crocheting. 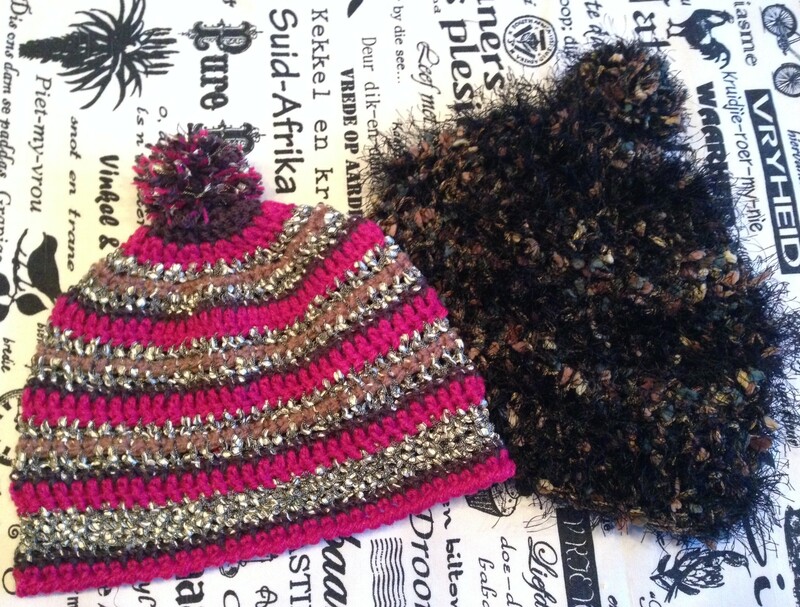 It’s Toque Season! 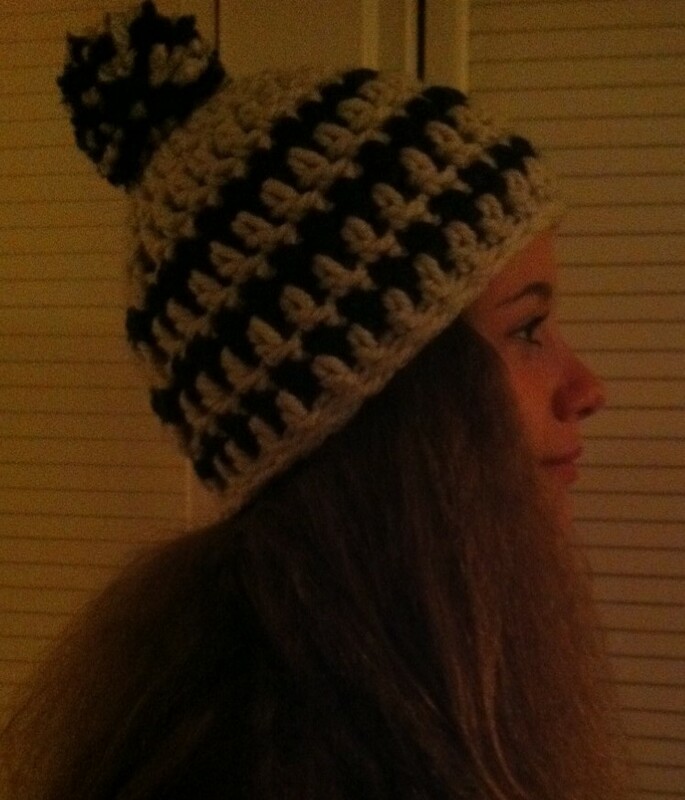 Today’s first Thing is the Elsa Toque. Back in February I crocheted Elsa, Anna and Olaf from Frozen for Esther’s friend, Daniëlle. 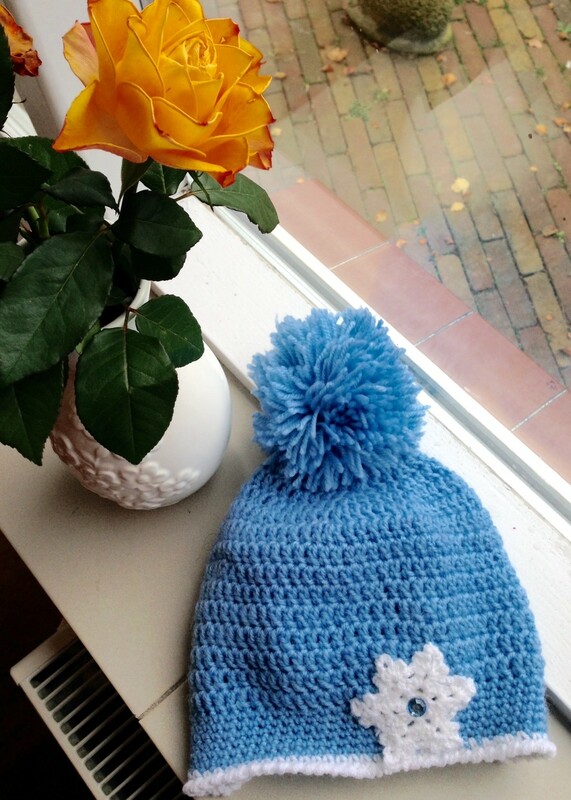 I still had lots of the blue yarn from Elsa’s dress left so I decided to make Daniëlle a matching Christmas gift. It’s crocheted with a 5mm hook, nice and soft, with a white crab stitch trim. I found the crocheted snowflake in my yarn basket and hot-glued a blue crystal for a sparkly touch. With the rest of the blue yarn I made a luxuriously heavy pom pom. Toque #2 is for my friend, Marko. I made him a toque back in January. 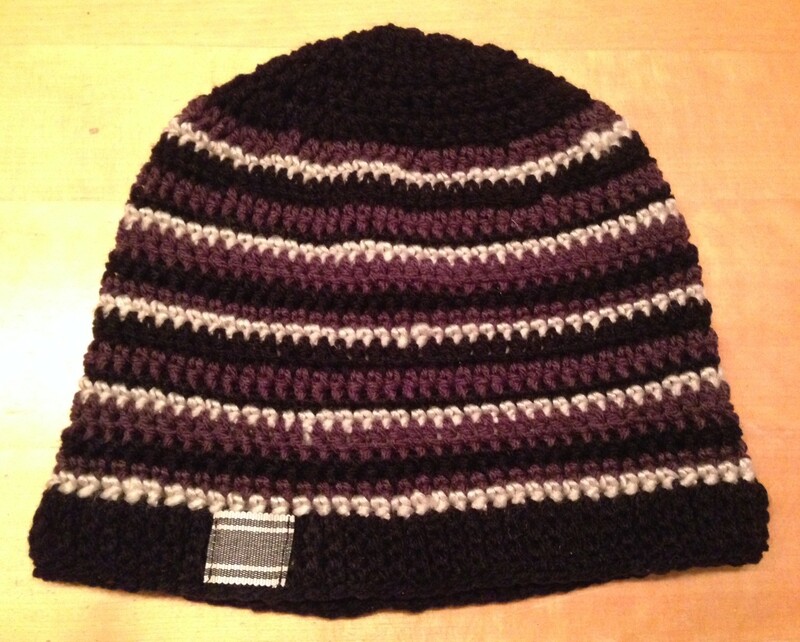 However, his head is too big and he requested another toque that would not cut off his circulation. I picked up some grey acrylic at my yarn lady around the corner and supplemented it with an assortment of wools and cottons from my stash. The pom pom has a bit of everything in it. This toque is cosy, fun, and most important, extra large. The final toque in this hat trick (get it? Hat trick? Hat?) is a going away gift for a friend who’s so cool he’s been mistaken for a Canadian. 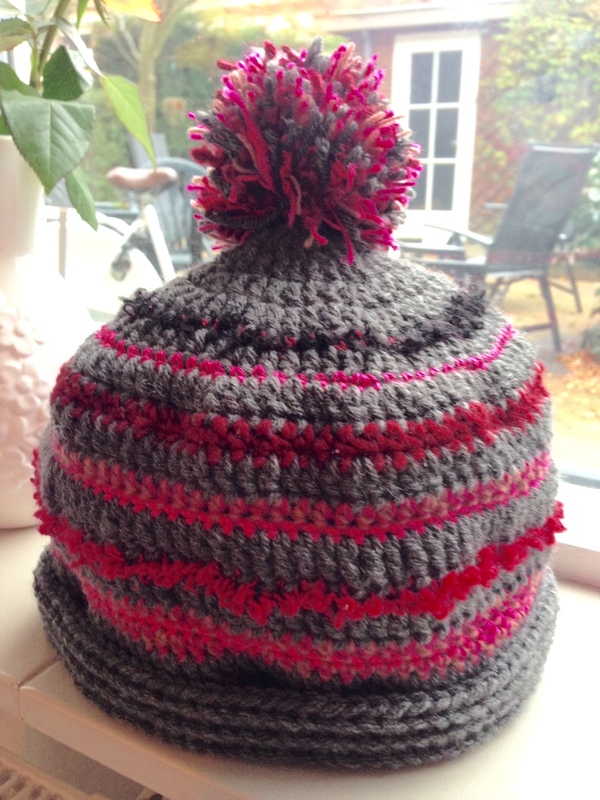 I used a 5mm hook and some grey and red wool. The red was a huge challenge. It was way too thick so I needed to first separate it into two strands. That upped the pain-in-the-neck factor significantly, but the colour was just right so it was worth it. I started out by following this pattern, but ended up doing my own thing after about row 6. I have difficulty following directions. 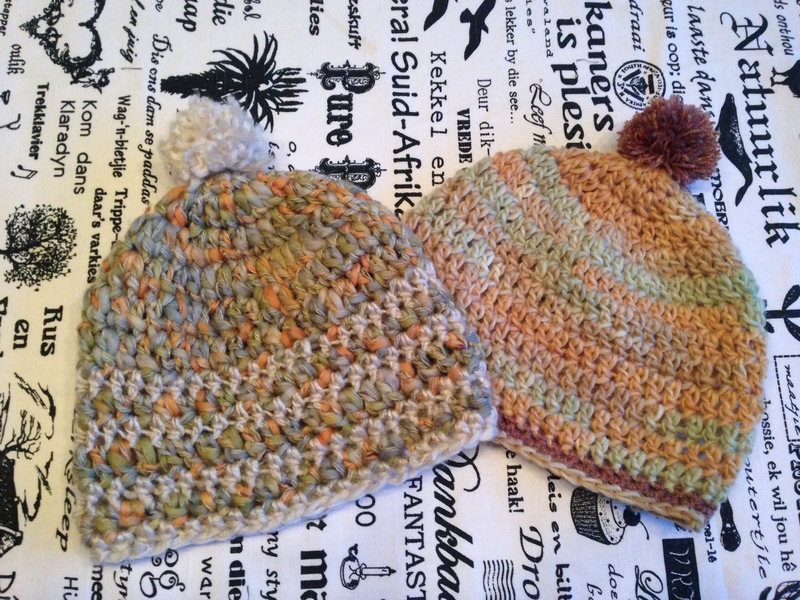 To finish it off I crocheted a ribbed edge using this tutorial, a new trick for me. 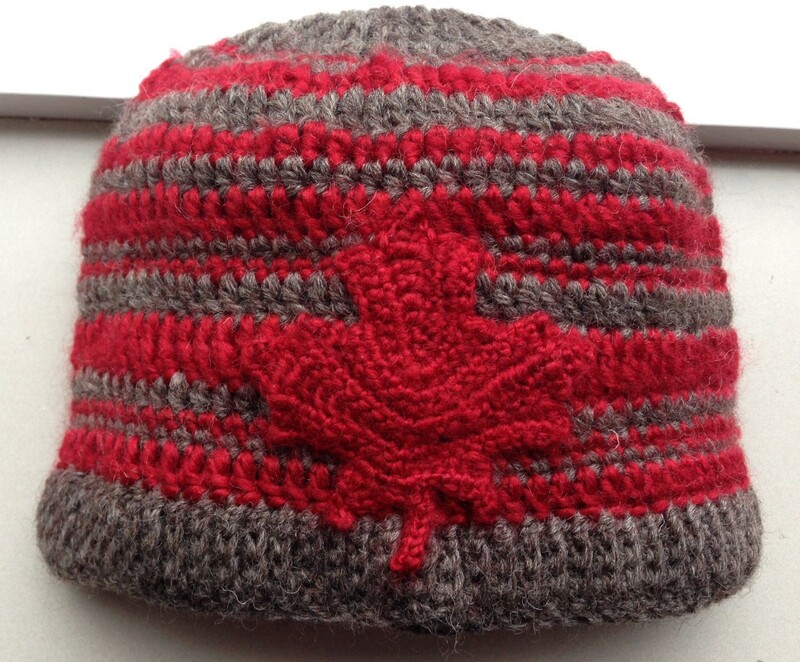 The maple leaf is from the same pattern I’ve used before. I love this hat. All it needs is a Roots label. It’s been some time since I’ve posted about a work in progress but I have a big one to report on. 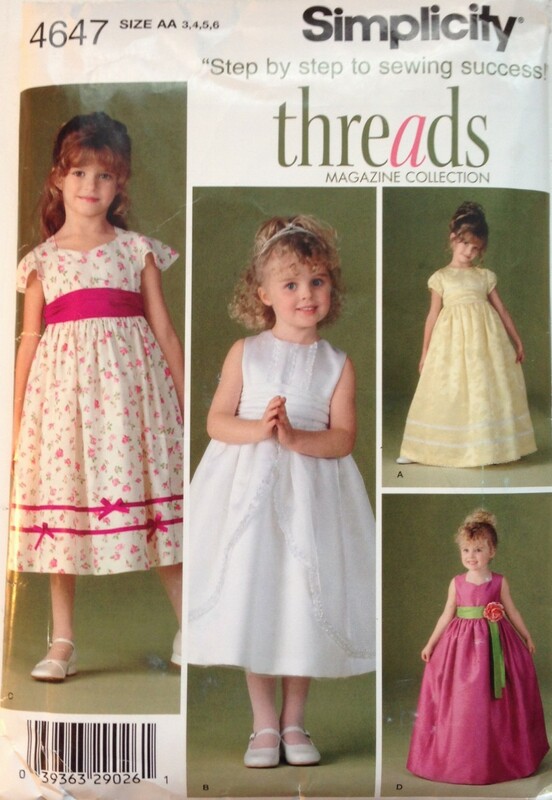 I’m making three flower girl dresses and they need to be done by the end of next week. The bodices are all complete. 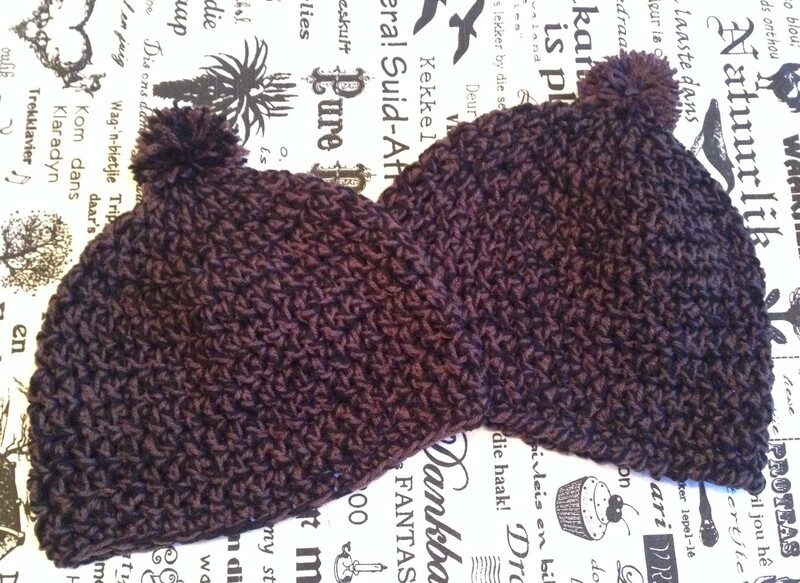 They’re fully lined and have a sweetheart neckline. I took my time with them to get it right. Now I’m busy with the skirts in all their poofy glory. My sewing room is a bower of tulle. So far they’re turning out beautifully. Here’s hoping I don’t botch them up in the final details like zippers and hems. It’s been known to happen. But before we get started, I would like to apologize for the lousy pictures. I take all photos with my iPhone, which does an adequate job outside in good lighting. However, here in the Netherlands the hours of daylight are decreasing and unless I’m on the ball and, you know, plan ahead, I’m left with dark, indoor shots. 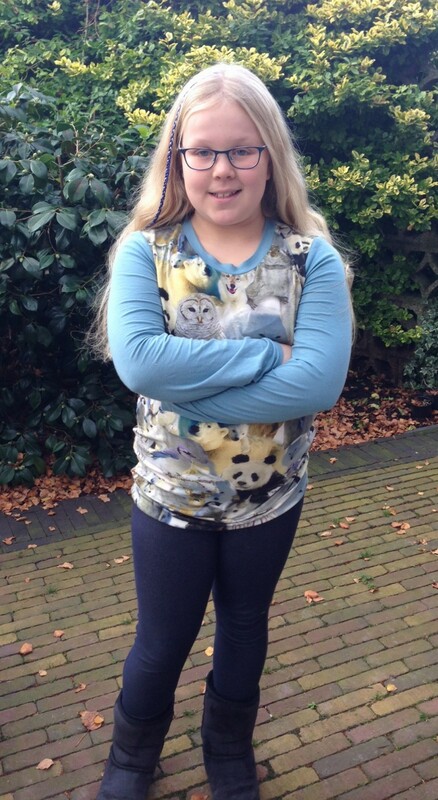 Last week, I made Esther a shirt out of an assortment of fabrics, including the sleeves off an old shirt of mine. That got me thinking. I raided my closet and found two t-shirts that have seen better days and were on my get-rid-of list. I pulled out my trusty Renfrew pattern and cut front and back panels from the striped t-shirt and sleeves from the solid black. I needed to save the rest of the black for another project so I used wide black elastic for the neckline. Since I kept the existing hems when I cut the sleeves and front/back pieces, I didn’t need to bother with any cuffs. Easy peasy. I think I’ll rummage together some fabric for one more long-sleeved shirt for Esther and she’ll be set for the winter. After all the effort I went through to get the fit on the Belcarra just right it seemed a shame to not make more. I picked up two different fabrics at the Haagse Markt for just two euros a metre and put my Belcarra knowledge to use. The flowered fabric was super sheer and impossible to press. However, as it wasn’t too slippery I could still work with it. I finished off the blouse with an invisible hem and wore it to a wedding the next day. The dark one? Oh my. Like sewing a bunch of live eels. Despite this, it turned out mostly okay except for the bottom hem. You can’t see it in the photo, but it doesn’t run exactly straight. I was so fed up with the project that I was just eyeballing the blind hem as I went along. My eyeballs, it appears, are not so accurate. I wear it under a cardigan and it’s fine. Fine, I tell you. I need to start wearing it more. It looks good with a black sweater and jeans and feels just a bit dressy–good for the grey days of December. Anyone who knew me in high school is going to recognize my last-minute, panicked, let’s-get-this-thing-done approach to the blog over the next 30 days. I had a tendency to procrastinate back in the day. I did most of my homework and studying on the bus. I remember writing an essay on Aldous Huxley’s Brave New World in under half an hour without having even read the book. Now I need to post on average three Things a day. And that’s if I post every day. Right then. Let’s get to work. Today’s Things are the last of the summer backlog. They were a gift for my sister-in-law, Linda. 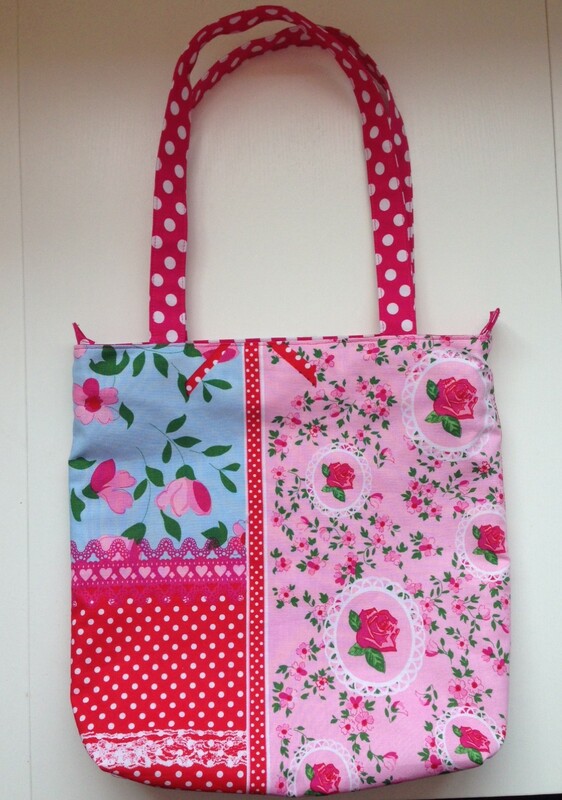 Using the endless supply of fabric left over from the tissue pouches, I made a book tote bag and matching accessories to take to the beach. 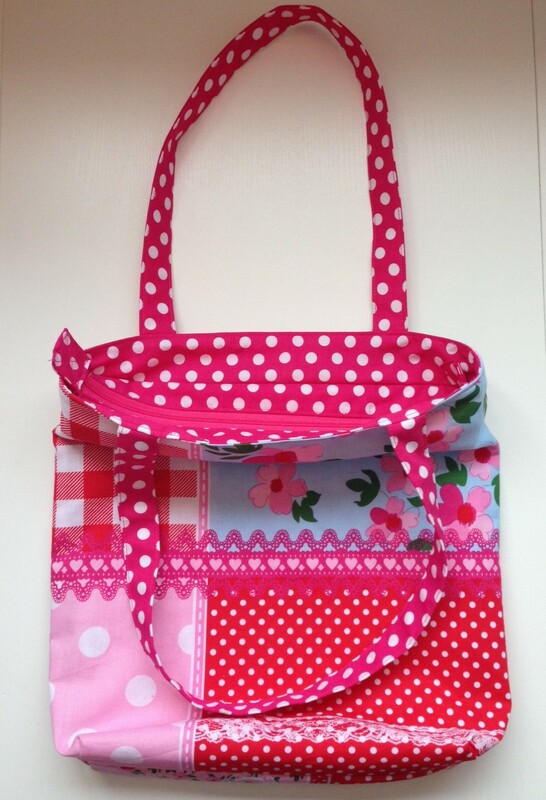 The bag itself had a recessed zipper, inside pockets and a gusseted bottom. 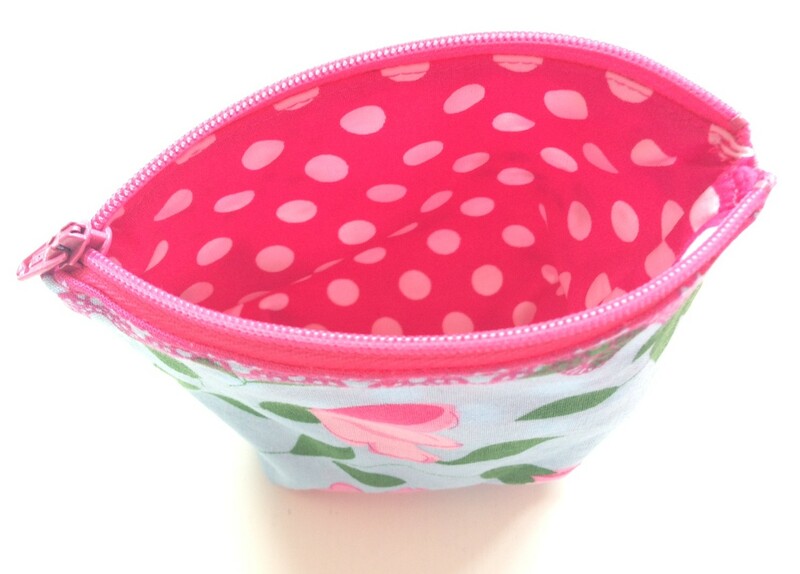 I didn’t use a pattern but this tutorial on recessed zippers was a huge help. 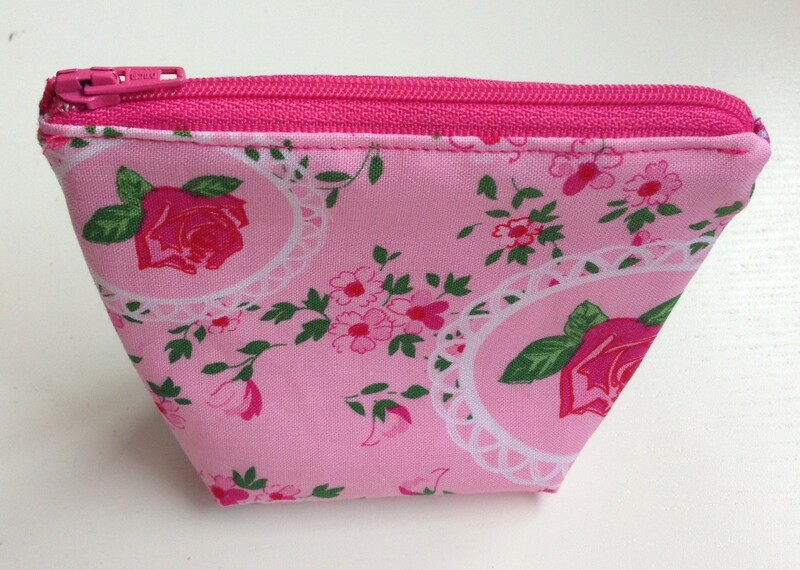 A little zip bag was needed to hold loonies for the ice cream shop. A drawstring sunglasses case lined in white velvet was for for the end of the day when the sun slipped behind the mountains. 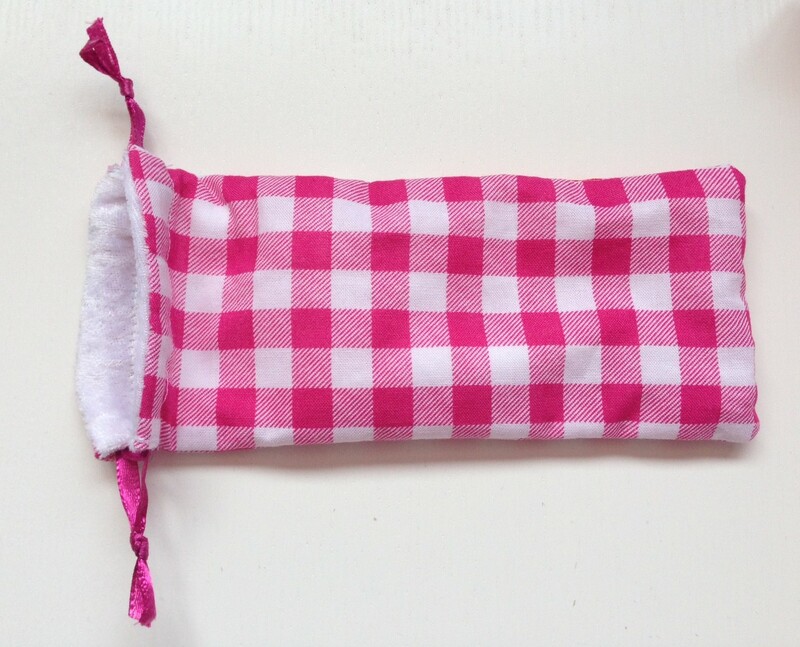 Of course no set is complete without a tissue pouch. 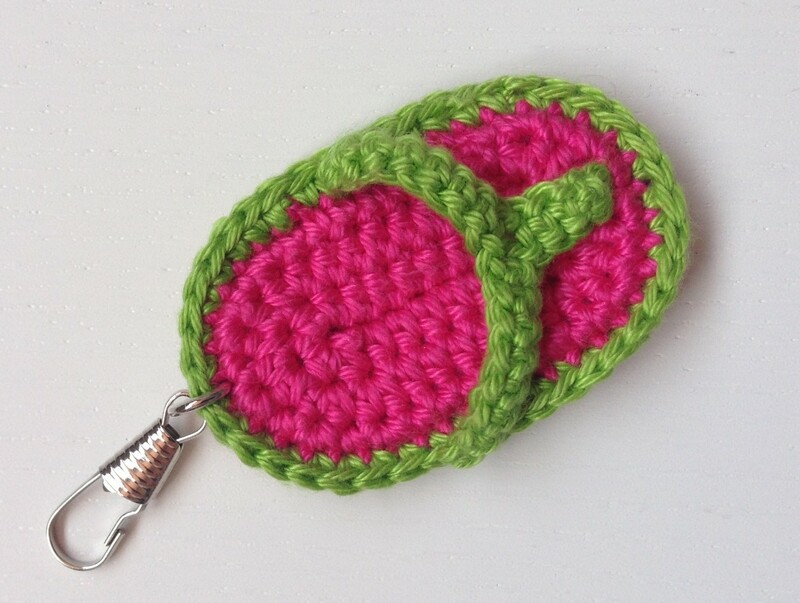 And a crocheted flip flop zipper pull was the cherry on top. 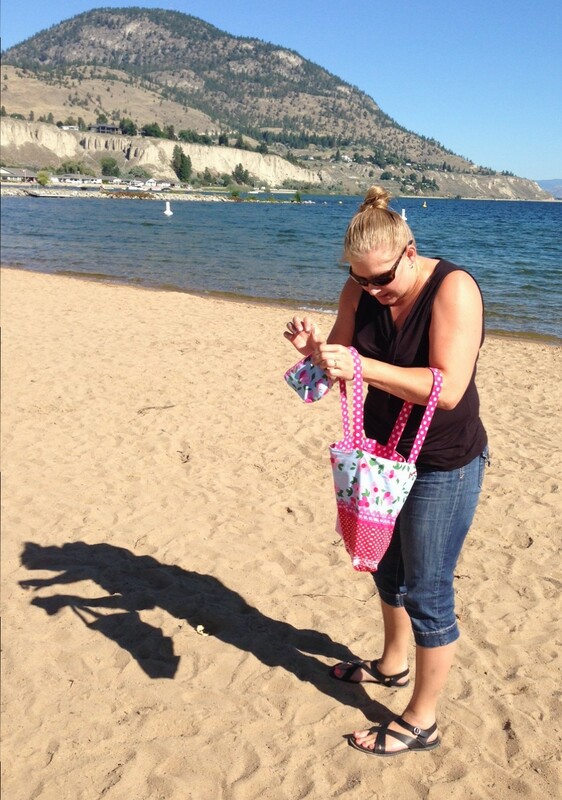 Perfect for the sandy beaches of the Okanagan! Time to get cracking. I have 37 days to make and post about 88 Things. I’d rather not resort to tissue pouches, either. 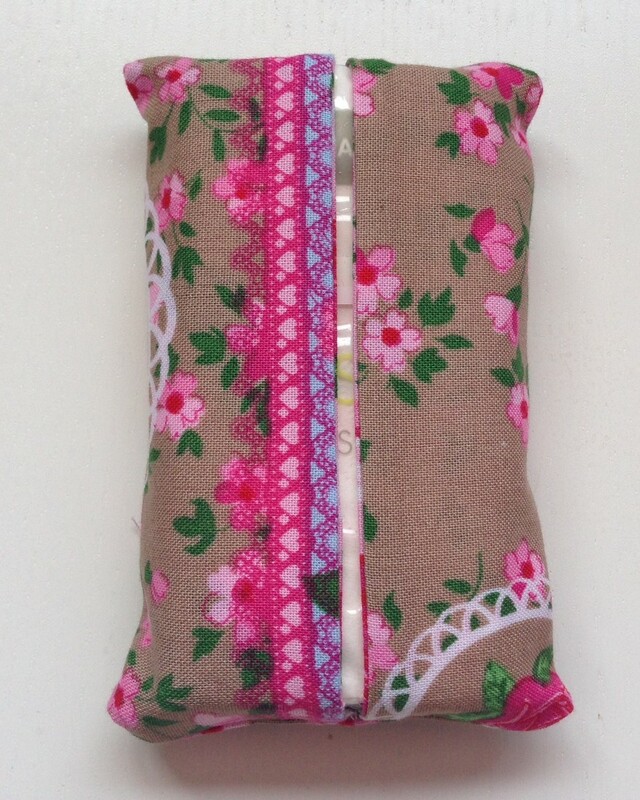 On the bright side, with the weather turning crisp and cold, my crafty urges have been reignited. This week I’ve made a shirt, a costume, and a hat, with another hat in progress. Today’s Thing is the shirt. Esther is in dire need of some longer, warmer shirts. She’s outgrown most of last winter’s clothes and it’s too cold for t-shirts now. Yesterday was a studiedag so Esther was home all day. 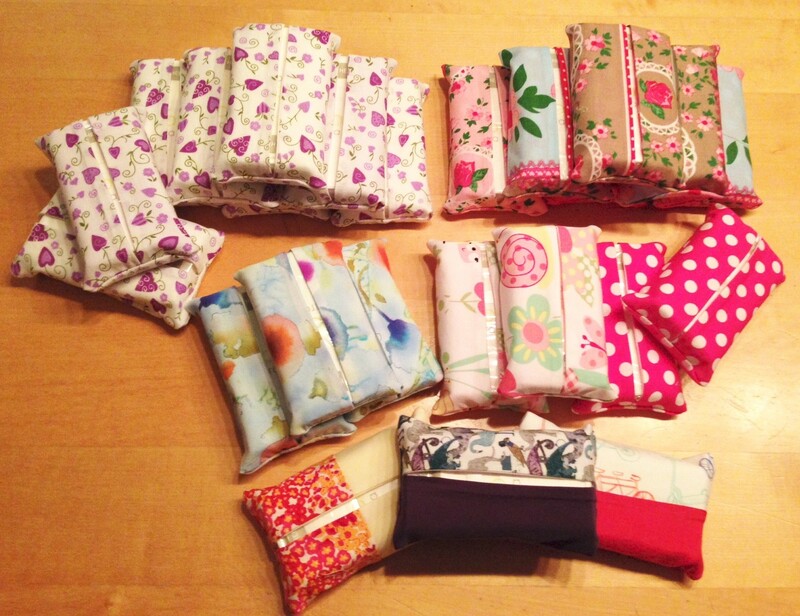 We puttered about in my sewing room and I assembled some fabrics. Back in July I made a couple of t-shirts for Esther. One was a wild animal print and the other featured cats. 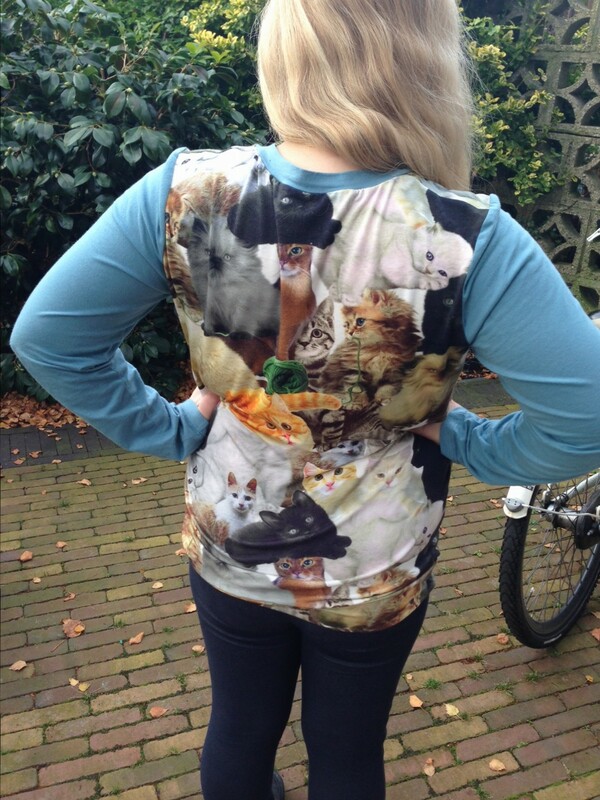 I had enough of the wild animal knit for the front of a shirt, and enough of the cats for the back. But what to do about sleeves? Then I found an old blue shirt of mine that was still in good shape but I just don’t like. We had our sleeves. I pulled out my trusty Renfrew pattern and cut out the front and back pieces and the cuff for the bottom. Next I chopped the sleeves off my old shirt. I laid the sleeve pattern piece against the sleeves and shaped the top of the sleeves to the pattern so they would fit properly. 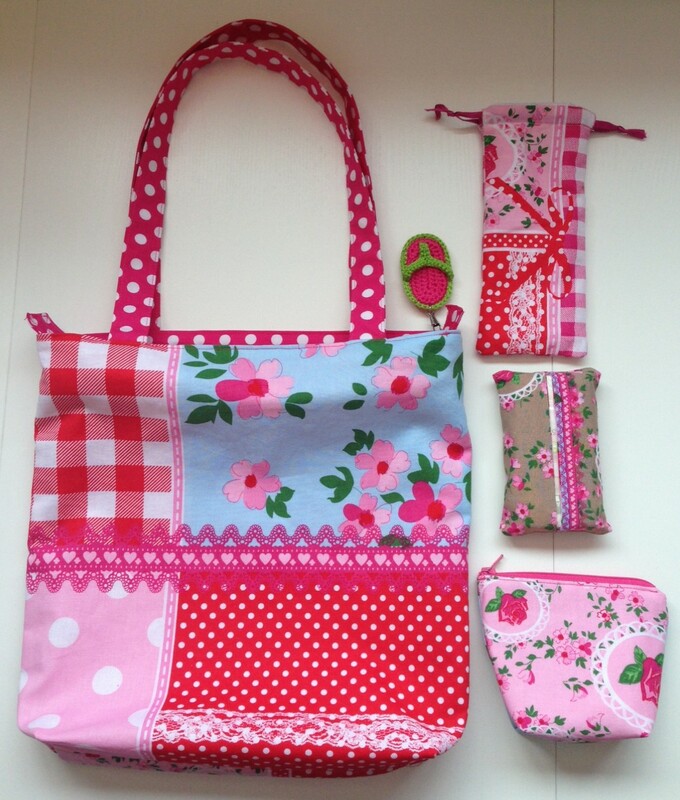 It came together great for such a patchwork affair. Despite some difficulties in getting the neck band to lay flat, I was done in a little over an hour. This has me inspired to see what other clothes I can repurpose. I have so many bits and bobs of fabric. Maybe I can cobble together a wardrobe with them. Poor Esther. In the next verse all the other kids make fun of Dolly. Maybe I better buy some more fabric.